You are here: Home » E-Shop » Neo-Garage/Mod » CD » V/A - Enjoy The Greeks! ON STAGE RECORDS proudly presents the first complete retrospective compilation of today's Greek rock'n'roll scene. 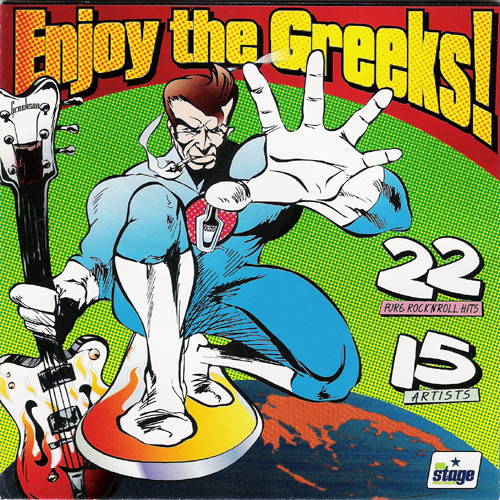 It is a long awaited compilation presenting the best crop of the "Now Sound" of the Greek rock'n'roll. This CD only release includes 15 artists in 22 tracks (most of the cuts are originals) with sounds varying from straight-on rockabilly to garage and from surf to psychedelia. You will find everything in here: explosive rock'n'roll/rockabilly from THE BULLETS and the good-old ALEXANDROS PERROS AND THE LONE STARS, "crazy" psychobilly from THE CRAZED and rockabilly/psychobilly from THE DUCKY BOYS, authentic surf from THE OVERTONES, swinging garage from THE FRANTIC V, the 60's sounding TEARDROPS, "cryptic" garage from TEDDY BOYS FROM THE CRYPT, "psychotic" garage from THE PSYKICKS, Aussie style garage from THE HYDES, garage-pop from the mysterious MARRY ME MARY, the promising indie-pop combo of 5* HOTEL, psychedelia/garage from UNKNOWN PASSAGE and STRANGE BREW as well as rhythm and blues from T4TROUBLE! All the tracks included are previously unreleased and very carefully selected! And like the bottle of the famous Greek aperitif "ouzo" at the front cover, this compilation is destined to be an exportable product and will surely appeal to the market internationally! "You keep on sweatin', they'll keep on shouting!" Grab it fast!